The home has a flat roof and two white cubes that intersect to create one striking geometric volume. Most of the facade has been painted white and the windows are an elegant grey. The grey windows on the lower level recede against the white hues of the upper level. This further accentuates the light, elevated quality of the home. The central kitchen forms the beating heart of the home. It is situated on the ground floor and runs adjacent to the dining room. It also has a good view from the kitchen sink and a second view towards the glass bay window we saw from the exterior shot. 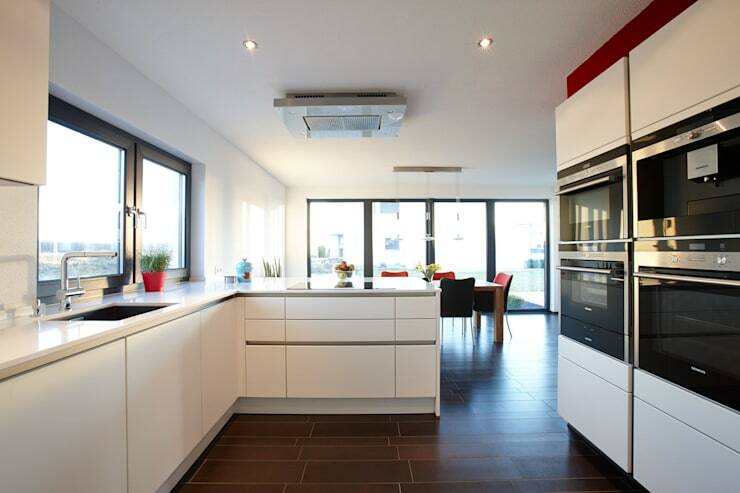 The L-shaped kitchen neatly integrates this space with the other living areas and has a streamlined, modern feel. 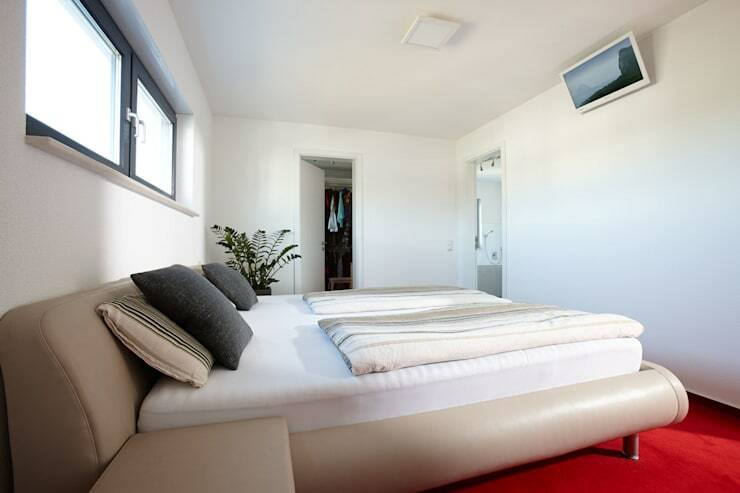 It is also generously proportioned and has space for a wall of standing appliances. Note how the simple uninterrupted lines and strong contrasts have been used to connect the kitchen decor with the other living areas. The dining room has lovely access to the triple-glazed glass bay window. 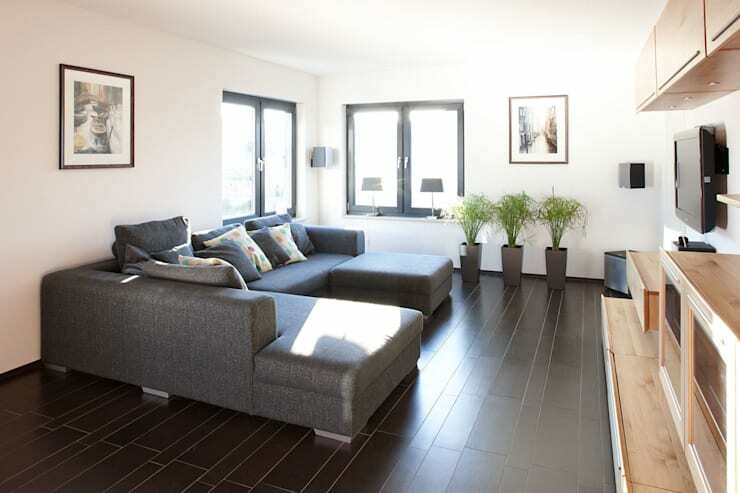 It could equally be used as a formal or casual dining area. From this angle, we can also get a larger sense of the configuration of the ground floor. Directly ahead is the living room we explored earlier and in the centre of the home is a staircase leading upstairs. The placement of the staircase acts as a barrier between the various living areas and gives the occupants a careful combination of privacy and connection. 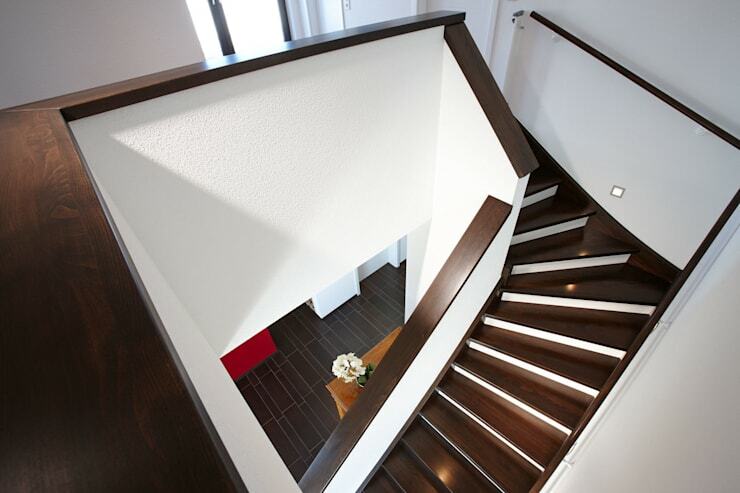 The dramatic contrast between the dark wood and white walls really comes into its own in the elegant wooden staircase. This combination of elements gives the home so much natural beauty that there's barely any need for decorations at all. This is a home built for a family with young children as well, so the sturdiness of natural wood was another important element for this family. The development plan for this area restricted the size of the second level, so it covers just 77m2. Despite this, the upstairs master bedroom enjoys a separate dressing room with vast storage facilities and a separate bathroom. It also has a high-set window that provides generous natural illumination and does little to impede on the occupant's privacy. It is simple, highly functional and comfortable above all. 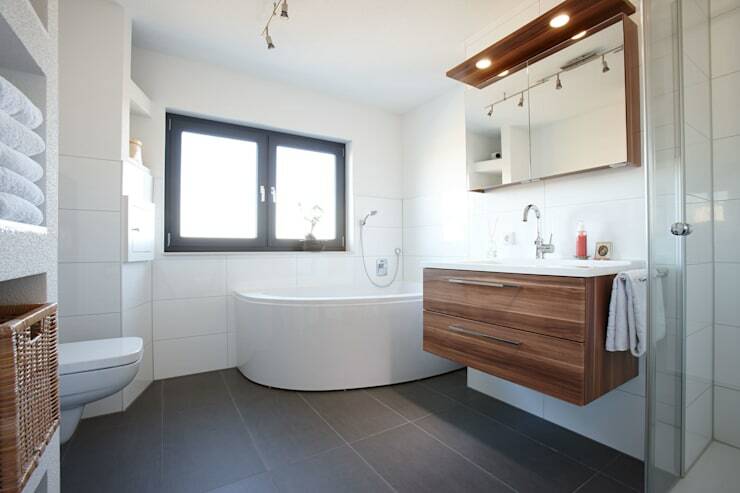 Every family home needs a large and functional bathroom and this one certainly delivers. There is a large corner bathtub, a shower stall and generous amounts of built-in storage. Wooden bathroom furnishings are present - but only in sparse amounts. This adds a rustic, homely feel to the bathroom without weighing it down with too many darker hues. Finally, the raised bathroom cabinet makes the bathroom feel that bit more bright, spacious and airy. For more family home inspiration, check out The Japanese timber home with a private heart. 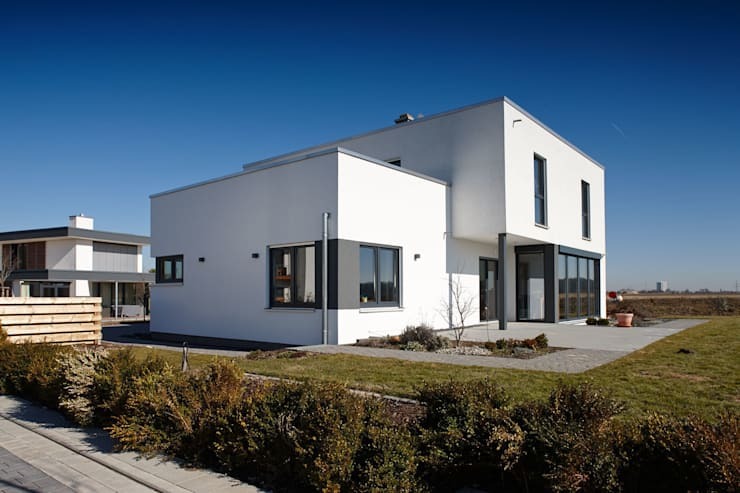 What is your favourite feature in this Bauhaus-style family home? Let us know in the comments field below!